Caco Invasion is exactly as it sounds, All monsters are cacodemons. It is based off the skulltag wad Cacocontamination which originally came from zdaemon 6 years ago (called Cacoconflict and cacocorruption). The maps were rather boring, though gameplay was still really fun. This is a remake of it with all new maps and parts of the old maps mixed in. This is still in heavy development by Popsoap and I (evilm0nk). 90% of the decorations can be destroyed, some can only be destroyed by explosives. So far there are about 70 cacodemons, about 50 are actually in the maps. Each level has its own set of cacodemons to match its surroundings (example: a green cacodemon will be in a green forest, a black cacodemon would be in a cave of some sort). Also the time of day will change about every 3.4 maps, this way it feels like the main mission isn't just one whole day. Some maps will also have an alternate Exit, which will lead to a different set of levels, but will eventually connect back to the main levels. The Goal is to shoot through 8-15 waves of cacodemons on each level and fight a boss at the end. There is a cheesy story as well to make the carnage more fun. So far there is 25 maps playable and there will be 4 chapters. Each chapter will have 10-13 maps (except chapter 4 which will have 5), on the final map of each chapter there will be an epic chapter boss fight! You start off as a normal enforcer who is enjoying a time of peace in his city, of course you never actually fought or done anything while on duty, so your practically a noob. Then (Dun Dun Dun) you get an unexpected mission, Apparently there was a distress beacon set off on an island not far from you. You and a handful of soldiers set off by boat to find out whats going on. Long stories short your attacked by a bunch of water cacodemons and eventually arrive at your destination alone and thats where your story begins. Since not every map is completed, the story isn't quiet there yet. Once more of the maps get completed, there will be more time to focus on the story part. Dialogue and more cutscenes will be more present in the future aswell. I Did not create this wad, the wad just contains skulltag textures which is needed. Last edited by Evilm0nk on Sun Sep 17, 2017 8:47 pm, edited 3 times in total. a mod based purely on everyone's favorite Doom monster! i'm in! +New map (map27), map story has no significance until I finish more maps. +Stronger cacodemons are more immune to explosives now. +Fixed a spelling error in map09 and a texture error in map27. +added PlasmaShredder gun (from Wrw.wad). +Heavy Rifle shoots a tad faster. Not that a story is necessary, Killing Cacodemons is always fun! I will have 3 more maps finished by the end of March, Finishing chapter 2 (Besides the 3 secret maps). Could you please make the cutscenes skippable? Sorry for the Delay, Yes I can. I implemented it so all you have to do is press the use button (Space bar or whatever you have it configured too) to skip a cutscene. I will have a new version with this implementation and a new map sometime next week. I really hope you're still working on this. This mod looks very promising and I have to admit that I'm rather fond of blowing up cacos. Still being worked on, just slowly. Good to hear. Quick suggestion: Asteroid cacos. A cacodemon that looks like huge spinning boulder with an eye. When it dies, it splits into two smaller asteroid cacos, which can in turn be split into smaller ones, etc. I just think it would make a good joke enemy. I've been playing Caco Invasion for a while and I have only one gripe so far. The "Spooky Caco" boss needs to be adjusted. As far as I can tell, it is impossible to beat without cheating. At any point during the battle, it can simply teleport right on top of the player, killing them instantly. In other words, if you can see it, you're dead already. There are a couple of ways this could be sorted. One would be to reduce the range of its teleport ability, and another would be to reduce the damage of its melee attack so that you can survive it if you are at full health. Trying to make a boss battle hard or scary is one thing, but making it impossible is going too far. I've tried to boot up this nice-looking mod but it seems that health and ammo HUD doesn't show in game, i have no problem with other mods so is the nwer version of gzdoom causing some problems? fryingpan wrote: I've tried to boot up this nice-looking mod but it seems that health and ammo HUD doesn't show in game, i have no problem with other mods so is the nwer version of gzdoom causing some problems? Try adjusting your screen size up or down. 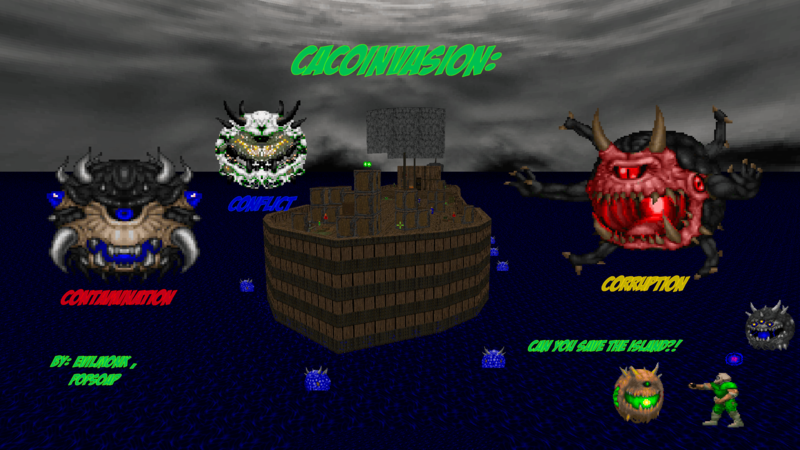 There are two basic kinds of HUD for GZDoom, standard and full screen, and Caco Invasion only comes with the full screen HUD. If you adjust the screen size one below maximum this should reveal the HUD. You may experience this problem with a few other mods.